Be sure to sign up for our newsletter! We will send you something special for your birthday or anniversary, and also may send occasional coupons for Free and Discounted items from our menu. So CLICK HERE to sign up today! 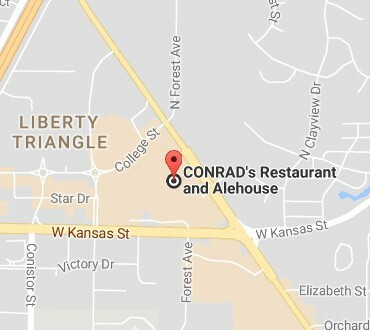 Here are a few recent reviews from CONRAD’s customers just like you. We are proud to have more than 300 online reviews with an average rating between 4 and 5 Stars. Dozens and Dozens of 5 Star Reviews! as enjoyable as possible for you. This Quick Access Menu is designed to help you get around fast and find the information you need.